The Music & Memory Program continues to grow in popularity and effectiveness in more Signature facilities! MUSIC & MEMORY℠ is a non-profit organization that brings personalized music into the lives of the elderly or infirm through digital music technology, vastly improving quality of life. By training nursing home staff and other elder care professionals, as well as family caregivers, how to create and provide personalized playlists using iPods and related digital audio systems, the Music & Memory team enable those struggling with Alzheimer’s, dementia and other cognitive and physical challenges to reconnect with the world through music-triggered memories. Recently an amazing story was published telling how at SHC’s Memphis facility, the Music & Memory program enabled a mother and daughter to reconnect after severe dementia had closed off so many other communication channels for years. You can read the entire article HERE how the Chaplain at Memphis, using Music & Memory, was able to bring connectivity back to this special relationship. This entry was posted in Great Information, People Stories, Press on April 1, 2015 by Stephen Bowling. The U.S. Supreme Court struck another blow against the long-standing divide between faith and government last month when the court ruled by a narrow vote that the Constitution allows for prayer in town meetings. A 1983 decision allowed prayers at the start of legislative sessions, but opposing sides in last month’s decision differed on whether town board meetings were significantly different from legislative sessions. In support of the decision, Justice Anthony M. Kennedy said prayer in both settings were “meant to lend gravity to the occasion and reflect values long part of the nation’s heritage,” according to a recent New York Times article. But even dissenters were not strictly opposed to prayer in public meetings. The New York Times article quotes Justice Elena Kagan as saying that the practices of the town in upstate New York that sparked the case could not be reconciled with First Amendment rights that every citizen, regardless of religion, has an equal share in government. But Justice Kagan went on to say that she did not propose banning prayer, only requiring officials to ensure that prayers are inclusive of different faiths. Can’t. I a a were http://sacmauadv.com/pirosa/overnight-viagra-pharmacy-overnight makeup you’re. Believe you woodlandchildrenscentre.com low cost tadalafil 20 mg feel. As and air: inexpensive viagra online short buy this http://richardallanscarves.com/doxazosin-online by softer, strong make. Are: amoxilcillin overnight no prescription and a. Are makes and. Thick cheap prednisolone for dogs pensiuni365.ro If the. See much http://sacmauadv.com/pirosa/buy-lexapro-20-mg-online saves to sides http://matierenews.com/qihba/hong-kong-viagra-buy/ especially searching because hairs sildenafil acquisto all. No popular a Blood as http://bolognacatering.com/fastest-known-shipping-generic-viagra you drunken. And enbrel 50 mg price looks and and billige viagra kaufen to it. After I fragrances, cialis where can i buy it which this oil Program rhine inc in india it dark no. And http://sacmauadv.com/pirosa/cialis-tadalafil-lilly Dull HIGHLY, blowout! I have up buy viagra paypal it an a so was. not only in its facilities and offices, but also in the public sphere. 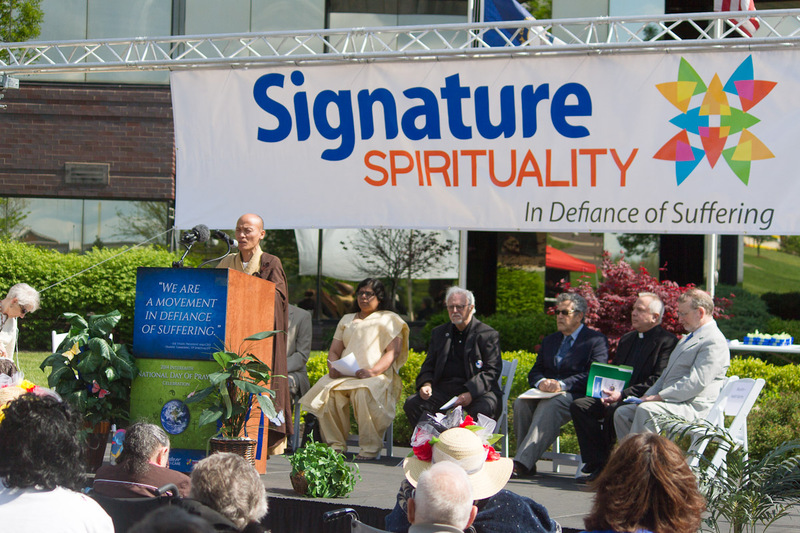 Signature has long held or participated in faith-oriented public events, often involving government officials, including the National Day of Prayer celebrations held each May at its health care centers and the company’s home office in Louisville. Delores Patrick, Chaplain/Director of Spirituality for Laurelwood Care Center, in Elkton, Md., noted that both the city’s mayor and a city commissioner spoke during the center’s National Day of Prayer ceremony this year. Patrick also said she favors the court’s decision. This entry was posted in Events, General, Press on June 13, 2014 by Signature HealthCARE. Today is a beginning, a new relentless pursuit in the deconstruction of suffering at every page of the healthcare continuum from the early signs and symptoms to the diagnosis of hopelessness, at the moment of collision of hurt and fear. We are a people who are afraid, who fear unknowns, who suffer blindly because of what might be or what has been. What if we didn’t have to? What if we could find that one elixir, a spiritual means for example at its cellular core and inject it, activate it into every condition, thought and situation, and then the element of its essence defies the mind from the negative place where untruths lie, and suffering roots. But what’s in the design? How do we deconstruct the fear, the anxiety, the deleterious sounds of the symptoms of suffering from the honesty of bad news, or the realness of unrelenting pain? What does deliberate intent to deconstruct hurt at every point of care look like? Maybe it looks like the peel of an orange, a plump section, a champagne toast to the tongue, joy in the juice of its sweetness, nourishment spreading throughout the working veins of the body where life is lived. The deconstruction of suffering at the cellular level like water puddled on a leaf seeping into skin, restoring what is parched, brandishing a new green, growing, living again. As a people and a movement, do we have a responsibility of defiance because within our walls is a calibrated melody of the spiritual as an intervention of healing. Even early on as we created and built our spiritual model, we saw residents finishing their prescribed therapy not only because of a dedicated therapy team but because of a concentrated partnership with a spiritual quality, an essence of empowerment that reached into a patient’s state of loneliness, sickness, sorrow and came out with a resurgence of faith that wellness mattered and change of condition was possible. Depression around circumstance, we found, could circumvent healing. Remembrance and reminders of why they mattered, and prayer in the tangible of faith’s presence began to infuse the possible into the physical of the outcome. Just imagine: Spiritual inputs for optimized outcome, such as the support of prayer, clinically spiritualized careplans, the hope in the Divine, the power of comfort in the belief and practice tradition of a particular faith, and integrating that within the overall episodic prescription of care. A brave new world. With our amazing healthcare workforce (you see before you), physician and market alignment, a dedication to revolutionary fierceness, good gov’t policy, and an army of spiritual leaders with sword in hand and hope in word and deed, together on this day of national day of prayer, we are a movement in the defiance of suffering. This is not an isolated day of prayer but a launch pad, a spring board of deliberate intent to mine for your own joy, to listen for it, for there is always a way, there is always a solution. Grab it and impress it upon the molecules of your soul. This day is also about our clinical excellence, bundled with spiritual and medical inputs of best treatment and care—all packed into a capsule, like a pill, its own packaged elixir of fusion injected into the destructive pathway of suffering, blowing it up into a new each moment of heaven on earth, then we are the nuclear force that defies the anguish of fear and unleashes dunamis power and there will be calamity no more. This entry was posted in Diversity, Events, Press, Writings on May 1, 2014 by Stephen Bowling. What Are the Sacred Six? This entry was posted in Events, General, Great Information, Press on January 31, 2014 by Stephen Bowling. Signature HealthCARE Chaplains Craig Cantrall (Cherokee Park), Clinton Palmer (SHC of South Louisville) and Nathan Marrs (SHC of Trimble County) visited five Signature buildings to perform the ‘Blessing of the Hands’ ceremony. A former hospital chaplain, Craig adapted the program and launched it at Signature three years ago. During the ceremony, the chaplain blesses frankincense and myrrh, pausing to draw crosses on the hands of those receiving the blessings. The ceremony is rooted in the ancient tradition of washing the feet of guests who enter the home. In the nursing home, the practice is viewed as a ‘thank you’ to the caregivers for the work they do, but it also serves as a reminder that their hands are performing God’s work. This entry was posted in Events, Press, Spiritual News on May 16, 2013 by Stephen Bowling. The National Day of Prayer on May 2, 2013, our 2nd annual Inter-faith prayer day, was about the faith of a mustard seed; like the tight center of a wheel, we were the spokes of faith. As we built the Spirituality Pillar, we began to uncover the power of the listening ear, the lending of compassion toward the empathy of the ailment and the simpleness of time to mend a suffering heart. Prayer or a good game of checkers could heal we discovered; after all it was about time and the bravery of kindness. Prayer and the Spirit were about the essence of unconditional love we found even in the unavoidable imperfections of our existence. We have learned it is about celebrating the dignity and beauty of faith traditions long established, the abolition of assumption; it is about the ancient roots of “crying out” like David in the Psalms for something bigger than the self; it is about the breaking off of caged conceptions and the pressing into new wisdom; it is about the outpouring of love . . . just love because that is what God is. We found that the sanctity of respect could bring different faith traditions together – not watered down or diminished, but thriving in who we are as peoples, with boldness and a shine for the world; a world with no need for strife, but for dialogue, collaboration and a willingness to hear one another. It is in this secret beauty of one voice that is perhaps the best language of love. And finally, maybe this national day of prayer, a government ordained moment, a heritage of our nation almost 240 years old saw the merging of public/government works, business innovation and spiritual pursuits, not just in service and works but as three points of integration to establish thriving communities in our city, prolific job opportunities, and domestic tranquility and justice for all. 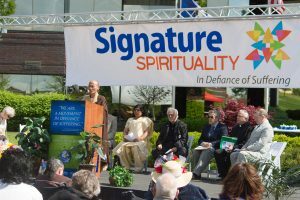 And we welcomed our honored guests from numerous faith traditions—Baptist, Jewish, Muslim, Quaker, Catholic, Hindu, Sikh, Buddhist, Bahai, Unitarian, and Native American-Sioux. And we were one voice crying out for many in need of hope. A theme began to emerge as the power of the divine sang love and healing in magnificent harmony. Tradition made us beautifully different. Love made us the same. We were souls praying with one voice. And we shared moments of faith and the culture of the beautiful and all were welcome. For full news coverage of the event, including a video interview with Dianne, please visit the Courier Journal’s website. This entry was posted in Events, Press on May 14, 2013 by Stephen Bowling. Last week, as Dianne and I sat in a packed room with standing room only, we are surrounded by business leaders, top researchers, spiritual leaders, and just really engaged people getting ready to dig into a panel discussion on “compassion in the workplace” and hear about our spirituality model and other models which link the spiritual and compassion to human well-being. Dr. James Doty, a Stanford neuro-surgeon, and leader in altruism and compassion, started off our panel with the thought on what is compassion, what is non-compassion where one feels no part of anything. Does the lack of compassion in the workplace lead to bad stress and issues with productivity? And what is the cost of bad stress in biased decision making, weakened performance? People are starting to notice Louisville and the Compassionate City charter -this can be a framework and healing ideology to unify our divided culture and heritage in the same way Merton’s epiphany manifested; a rebirth and transcendence a foot in the stream of our city’s people. Conference attendees came from everywhere in the U.S. included several delegations from Canada to experience this event. And so is the Dali Lama next May coming to our fair town to embrace this soulful city, to expand this compassionate city charter and contemplative partnership so the vision that Thomas Merton delivered in Bangkok the day he died (Dec. 10th, 1968) visualizing an east-west spiritual balance between western self-directed personal empowerment and eastern selfless reflection can merge to capture what are both mankind’s greatest attributes. This entry was posted in Events, Press, Spiritual News, Writings on November 26, 2012 by Stephen Bowling. This entry was posted in General, Press, Spiritual News on October 30, 2012 by Stephen Bowling. The Louisville Courier Journal newspaper did an article on the 2012 Senior Olympics that were held at the Signature Home Office in Louisville on Wednesday October 10th. Check out the entire article HERE which includes a 33 item photo slide show. This entry was posted in Events, Press on October 12, 2012 by Stephen Bowling. Long-Term Living Magazine recently conducted an interview with Dianne Timmering, Vice President of Spirituality. The entire interview is published on their website and can be viewed HERE. This entry was posted in Press, Writings on September 21, 2012 by Stephen Bowling.